Blue Swede was a Swedish rock band headlined by Björn Skifs which was active 1973–1975. Blue Swede released two albums of cover versions, including a rendition of "Hooked on a Feeling", which brought them international chart success. The band consisted of Anders Berglund (piano), Björn Skifs (lead vocals), Bosse Liljedahl (bass), Hinke Ekestubbe (saxophone), Jan Guldbäck (drums), Michael Areklew (guitar) and Tommy Berglund (trumpet). They disbanded after Skifs decided to embark on his solo career. Blue Swede was first formed in 1973, when Björn Skifs, a top vocalist in Sweden, was looking for a band to accompany him during his concerts. The band was originally called "Blåblus" (Swedish for "blue blouse" or "blue jeans", a pun on the word "blues") and featured Skifs singing the lead vocals. The band got their international breakthrough in 1974 with their cover of the 1968 B. J. Thomas song "Hooked on a Feeling." 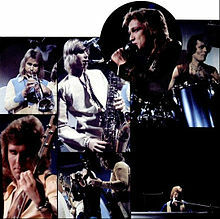 Blue Swede recorded Thomas' song in 1973, but based its rendition of the song on a 1971 version released by British pop eccentric Jonathan King, which created the "ooga-chaka" introduction. Blue Swede released "Hooked on a Feeling" in Sweden in May 1973 and in the United States in February 1974. The song reached number one in the U.S. for one week in April 1974 and stayed in the Billboard Hot 100 chart for 18 weeks. The track also topped charts in Australia, Canada, and the Netherlands, where it reached a peak chart position of 26. To capitalize on the success of the song, Blue Swede released an album of the same name that same year. Throughout the rest of 1974, two follow-up singles from the same album were released: "Silly Milly", which peaked at position 71 in the U.S., and a cover of The Association's "Never My Love", which made the Top Ten by peaking at position 7. From the band's 1975 follow-up album, Out of the Blue, they recorded a medley of "Hush" by Deep Purple and "I'm Alive" by Tommy James and the Shondells (not The Hollies' song of the same name), peaking at position 61 in the U.S, and achieving its greatest chart success in Scandinavia. The band's cover of "Hooked on a Feeling" first regained popularity in 1992, in Quentin Tarantino's breakout hit film Reservoir Dogs. In 2014, the same cover was featured prominently in the film Guardians of the Galaxy. Prior to the film's release, the song's appearance in a trailer resulted in a significant spike in sales. ^ a b Caulfield, Keith (20 February 2014). "Blue Swede's 'Hooked On a Feeling' Sales Soar Thanks To 'Guardians of the Galaxy' Trailer". Billboard.com. Retrieved 3 August 2014. ^ a b Murrells, Joseph (1978). The Book of Golden Discs (2nd ed.). London: Barrie and Jenkins Ltd. p. 325. ISBN 0-214-20512-6. ^ Schaefer, John (April 1, 2014). The Story of 'Hooked On a Feeling'. SoundCheck: That Was a Hit?!. NPR. ^ "DARK SIDE OF THE POWER OF BELIEF IS BROUGHT TO LIGHT IN “HOLY HELL”" Retrieved September 5, 2016. This page was last edited on 15 October 2018, at 06:33 (UTC).